This morning I contacted the offices of Rep. Daniel B. Short and Chief Clerk of the House Richard Puffer and confirmed that C. Peter Wagner was indeed the recipient of a tribute from the Delaware House of Representatives on January 19. Right Wing Watch posted the link to the Global Spheres e-mail in which Wagner described his reception in Delaware, titled "Apostolic Government in Delaware," and describing the tribute by the Delaware State House for his work "commissioning apostles." A copy of the tribute and full text follow the article. Meanwhile, for a year or more I have been in touch with apostolic leadership in the state of Delaware, the first state admitted to the union, about the possibility of organizing key apostles in the state and having their government recognized by the state. I was honored to be invited to sit with six of these leaders for an extended meeting on January 19, 2012. Preparations for this meeting had been going on for several months. Those present agreed to constitute themselves as the Delaware Council of Apostles, and they appointed one of their number to serve as Convening Apostle. Blogger Christian Dem in NC had questioned the validity of Wagner's claims; a reasonable response since it is difficult to believe that a state legislature with an overwhelming Democratic majority (26-15) would approve a tribute to Wagner for commissioning apostles, and the tribute can not be found on the state's website of legislative activity. In this case, truth is stranger than fiction and it demonstrates the need for more publicity about the New Apostolic Reformation (NAR) and its mission of overlaying the current Protestant denominations with the NAR's own structure of apostles with authority over geographic areas. 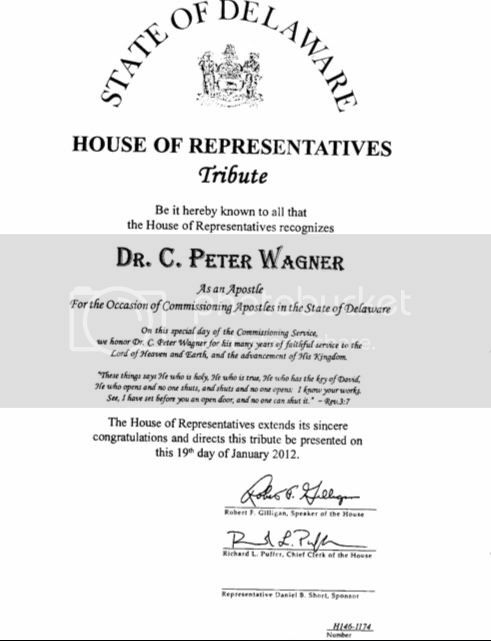 Be it known to all that the House of Representatives recognizes Dr. C. Peter Wagner As an Apostle For the Occasion of Commissioning Apostles in the State of Delaware. The House of Representatives extends its sincere congratulations and directs this tribute to be presented on this 19th day of January 2012. (Signed) Robert F. Gilligan, Speaker of the House; Richard L. Puffer, Chief Clerk of the House, Representative Daniel B., Short, Sponsor." From the article "...it is difficult to believe that a state legislature with an overwhelming Democratic majority (24-17) would approve a tribute to Wagner for commissioning apostles..." This should come as no real surprise. The Democratic leadership has been working towards changing the perception that they are the party for the non religious for several years now. Seems to me that this legislature got snowed ... after all, not many of them have even HEARD of Wagner. The reason I found it hard to believe was that it is so difficult in most lower houses (federal and state) for the minority to even get a piece of legislation to the floor. Weren't the original twelve enough? They basically converted the entire Roman empire. What does C Peter think he's doing? Bah humbug! The House has a 26-15 Dem majority. I made the correction. The 24-17 number was from the last legislative session, before the 2010 election. As for me I'll stick with the original twelve, and their Lord! Fortunately, Washington State is one of the most unreligious states in the union so we don't have to worry much about this cr-p. I'm glad to be a conservatively theological Christian here. I don't have to worry about those kooks much.